Enjoy the beautiful views and sandy beach bottom that this adorable cabin has to offer! This great property offers a spacious living room with walk-out to a large deck with screened-in porch, kitchen, dining area, full bath, and 3 bedrooms ~ all with new décor and waiting for you to come and relax and enjoy the beauty of the northwoods! 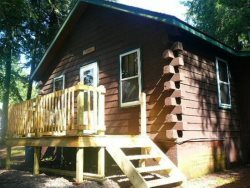 Visit this cabin to experience the truly wonderful atmosphere that the northwoods has to offer! Schnur Lake is 158 acres of wonderful swimming, fishing, boating, kayaking, or canoeing! The maximum depth is 27 feet and the fish include Muskie, Northern Pike, Walleye, LM and SM Bass, and Panfish. Charcoal grill - bring your own charcoal!